Product #60595 | SKU BV10H + C674TM | 0.0 (no ratings yet) Thanks for your rating! The Benro C674TM Carbon Fibre Tandem-Leg Video Tripod provides a flexible tripod system that includes a Benro BV10H Fluid Head. The head supports up to 10kg and features four steps of counterbalance plus a zero setting, as well as independent pan and tilt drag settings. The head features a removable 100mm half ball base for quick leveling, which when removed reveals a flat base useful for mounting on sliders or placing low and flush on flat surfaces. The included carbon fiber legs support 60kg of weight, more than sufficient for the BV10H head, your camera, and accessories. It includes a removable mid-level spreader and incorporates a 100mm bowl for use with fluid heads with a 100mm half ball base. The legs have a height range of 45.7cm to 156cm, allowing you to go from low-angle to eye-level shooting. The legs are independently expandable, and the mid-level spreader makes the legs well suited for working on uneven terrain. Removable rubber boots cover the foot spikes when working on hard or delicate surfaces. The carbon fibre C674TM Tandem-Leg Video Tripod from Benro is a video tripod with a 100mm bowl, compatible with industry-standard 100mm video heads. 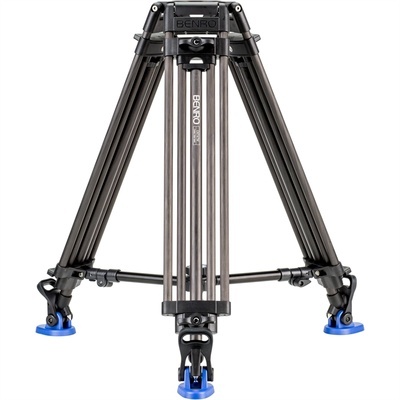 The three-section double-tandem leg design allows for height adjustment and offers enhanced torsional rigidity, making this tripod well-suited for use with rigged cameras and heavy loads up to 60kg. An adjustable and removable mid-level spreader provides control over the C674TM's footprint, and a bubble level helps you hew to the horizon. The oversized rotary clamp leg locks are easy to operate even while wearing gloves, requiring only half a turn to lock and unlock. Equipped with dual spikes, the tripod's rubber feet are suitable for both indoor and outdoor use, as well as for any type of terrain. 3/8"-16 foot mounts allow the feet to be interchanged as needed. The C674TM comes with a padded carrying case. The Benro BV10H 100mm Video Head supports cameras and accessories up to 10kg, and features a sliding balance plate with both a 1/4"-20 and 3/8"-16 camera tie-down screws. Incorporating a 100mm half ball fitting for quick levelling without having to adjust the legs, it provides a wide platform to support your camera. The BV10H fluid head features a 4-step counterbalance system with a zero setting for when you want the head to be completely free. Likewise, the pan and tilt functions feature three steps, plus a zero setting. Pan and tilt drag are independent and each function has its own lock. An integrated 3/8"-16 threaded mounting hole enables you to mount accessories directly to the head, relieving the strain of mounting them to your camera. The panhandle mounts via a rosette, and can be attached to either side of the fluid head. An integrated bubble level helps you quickly level the head. The legs feature a minimum height of 45.7cm and a maximum height of 156cm. The included mid-level spreader allows for increased stability on uneven surfaces as opposed to a ground spreader which may buckle on uneven surfaces. The tripod's spiked feet provide improved purchase on soft ground, and the included pads can easily be slipped onto the foot spikes when working on slick or delicate surfaces. The legs are individually adjustable in length for working on uneven ground. Sliding balance plate is 501/504PL compatible, and includes 1/4"-20 and 3/8"-16 camera tie-down screws. The pan, tilt, and counterbalance settings control are similar in function and use, for an easy learning curve and simpler operation. Counterbalance settings: 0, 8.8, 13.2, 17.6, and 10kg. Independent pan and tilt drag and locks. Pan and tilt adjustments and locks are located on the left side of the head making it easy to adjust with a single hand while operating the camera. Pan, tilt, and counterbalance settings are stepped and indexed, which allows you to make precise adjustments by feel. The 100mm half ball can be used on tripod legs and mounting adapters with standard 100mm half-ball adapters. The tilt range allows you to tilt from straight down to almost straight up. The included panhandle mounts to the fluid head via a rosette. The head incorporates two rosettes, one on each side, which enables mounting the panhandle on the left or right side of the head. An additional panhandle (not included) can be mounted to the fluid head via the second rosette.